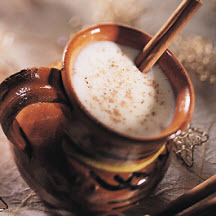 A delicious, warm and hearty cinnamon-scented Mexican holiday drink. In a two-quart sauce pan, bring 2 cups water, piloncillo and cinnamon stick to a boil. Dissolve masa in 1/2 cup water; add to pan. Return to boil; reduce heat to medium and continue to gently boil for 4 or 5 minutes, stirring occasionally. Add milk and continue cooking for 5 more minutes, stirring constantly. Serve very hot in mugs.